Give Craig A Chance, Will You? 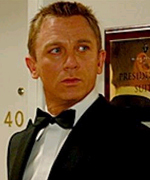 Bond is briefed by "M"
As the cinematic world awaits the release of the twenty-first Bond film, Casino Royale, extreme criticism has come down upon the newly elected Bond...Daniel Craig. 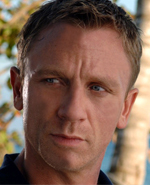 Let me just reinforce it for those of you living in the past: Daniel Craig is James Bond. It's pointless boycotting, it's pointless whinging. If you don't like it get on with your life and follow another franchise. Truthfully speaking the James Bond franchise is the most successful in cinematic history and will continue to be so, if you just give it a chance! How can anyone possibly boycott a film, let alone a Bond before actually seeing the lead actor in one before? If you think about it, there's no logic and it seems rather childish. These supposed �Bond fans� don't seem to know much about the historical implications of hiring a well known actress to play the part of a Bond girl, as in recent Bondian cinematic history that move was indeed a terrible one, with Halle Berry the last �big name� to feature in a film. Need I say more? The producers Barbara Broccoli and Michael G. Wilson have taken the correct steps so far. Hiring an actor such as Craig, who seems to possess a darkness that mirrors Fleming's original intention and something along the lines of Dalton. Just what the series needed. Now the series returns to its roots, Craig is faced with the difficult battle both Lazenby and Dalton endured following on from Connery and Moore respectively. Craig must follow on from the enormously successful Pierce Brosnan. This is a problem. One thing I can tell you is that the already poor publicity towards Craig will not help his cause. He needs all the help he can get, regardless of his acting ability. The media will play a huge role (as it usually does) in promoting the Bond film. If it's bad press, we've just got to hope it doesn't affect the general movie-goer and prevent them from either seeing it or if they do see it even enjoying it. The bottom line is really give Daniel Craig a break. You cannot judge an actor without witnessing a performance. So wait until you've seen the movie before you think of boycotting the next film. Having seen Craig's film Layer Cake (now one of my favourite films of all time), you get the sense that Craig will bring the correct sort of intensity to the role of James Bond, that could make him the best Bond of the series! His next challenge is to obviously take the greatest cinematic franchise further into the twenty-first century and it all starts with the twenty-first Bond film. Bond's rebirth. Daniel Craig: I wish you the best of luck. You'll need it!